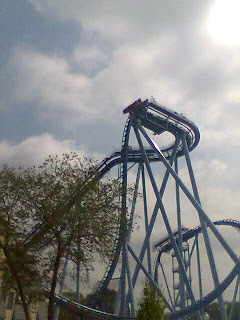 The hubby and I went to Bush Gardens Europe yesterday in Williamsburg. They have a 'Here's To Our Heroes' offer every year where they give free tickets to military and their dependents. Which I think is very nice. So we decided to take advantage of said offer. We enjoy this park because it's clean, well laid out and has some good places to eat. They also have shows to see. They also have a beer presentation where you sample four beers. Plus they have beer to drink in the park. Bonus! But if you get a ticket out of your own pocket it may not feel so great. Ticket price for a single day is about $55. Ouch! Paramount King's Dominion is another park that we have been to. It may not have as many shows, as fantastic of variety of food or the beer, but it does have more roller coasters and a water park. While the ticket price for two days is $52. Sweet! Hmmm. I think Bush Gardens needs to rethink themselves if they hope to get repeat users with the military. Most enlisted families can't afford multiple trips to Bush Gardens, but King's Dominion might be more doable. Noah wants to know if you and Uncle Jim road the roller coaster you have pictured. He wants to come see you some day and go to see roller coasters.